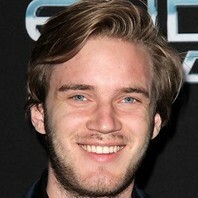 Born Felix Kjellberg, he is a YouTube celebrity whose comedy and video game commentary channel has earned over 82 million subscribers. He was voted Most Popular Gaming Web Star at the 2014 Teen Choice Awards. In 2016, he was included on Time Magazine's list of The World's 100 Most Influential People.